What You'll Need: scriptures, Gospel Art Kit picture #117, coloring page and coloring supplies of your choice. Ingredients to make treat if desired. Mosiah 2:41 - And moreover, I would desire that ye should consider on the blessed and happy state of those that keep the commandments of God. For behold, they are blessed in all things, both temporal and spiritual; and if they hold out faithful to the end they are received into heaven, that thereby they may dwell with God in a state of never-ending happiness. O remember, remember that these things are true; for the Lord God hath spoken it. Showing Love Through Obeying Heavenly Father's Commandments. Heavenly Father loves each of us. He wants us to be happy. He has made rules for us to follow that will keep us safe and make us happy. We can show how much we love him by obeying his commandments. In the Scriptures we learn about a righteous man who showed his love for Heavenly Father by being obedient. 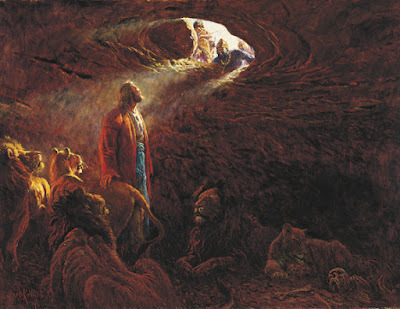 (show Gospel Art Kit picture #117 - Daniel in the Lion's Den) and read the following story. Daniel lived in a land called Babylon. Daniel was righteous and always obeyed Heavenly Father. Wicked princes told the King make a rule that no one in the kingdom would be allowed to pray Heavenly Father for thirty days. They wanted to make a rule that you could only pray to the King. Anyone who broke the law was to be put into a den (or pit) filled with lions. But prayer was so important to Daniel that, even though he knew he might be cast to the wild lions, he still prayed to Heavenly Father three times every day. The bad princes spied on Daniel's house. When they saw him praying, they hurried to tell the king. The king loved Daniel and realized what a terrible trick the wicked princes had played. The King tried to change the law to save Daniel from the lions, but the princes told him no law made by him could be changed. When evening came, Daniel was thrown into the den of hungry lions. The King was so happy and he took Daniel be taken out of the lions’ den. Because of Daniel’s faith in God, he had not even been scratched by the hungry lions. Then the king commanded that the wicked princes be put into the den of lions, where they were killed at once. Afterward the King made a new rule that people could worship and pray to Heavenly Father. Heavenly Father has given us Prophets, the scriptures, Church Leaders and parents to teach us the right things to do and help us to be obedient. Just like Heavenly Father, Daddy and Mommy love each of you. We want you to be happy. We make rules for you to follow that will keep you safe and make you happy. You can show your love by obeying our rules. Q: What are some rules Daddy and Mommy made to keep us safe? - Holding hands while crossing the street. - Don't touch the hot stove. - Don't play with scissors. Q: What are some rules Daddy and Mommy made to help us to be happy? - Bedtime. Explain to your kids that being tired makes us feel grumpy and unhappy. - No hitting, punching, kicking, etc. - Having meal times together. Heavenly Father wants each of us to obey His commandments and he also wants us to obey our Father and Mother. The commandments help us be happy and keep us safe and so do the rules in our family. - Share a personal story of a time when you were little and a rule your parents made kept you safe or added to your happiness. Bear your testimony about happiness coming through being obedient. Practice Song: If learning the song of the month, go over the words and music with your family. You may choose to use pictures, word charts or other games which help family members learn the words. Play a game of Simon Says, but instead give each parent a turn to be it and when it's there turn to call out the directions they change the name of the game to "Mommy Says" or "Daddy Says". Make it as silly as you want and have tons of fun! Download this coloring page of Daniel praying in the Lion's Den. 1. Frost prepared cupcakes with dark orange frosting. Add a small circle of light orange slightly lower than center. 2. Add caramel popcorn all around outer edge, pressing down lightly into frosting. 3. Add brown mini M&M's as eyes and a red mini M&M as a nose. 4. Break each pretzel stick in half and stick into cupcake top on either side of the nose to form whiskers. 5. Add a Cheerio for each ear (optional). This is a great leason plan! Thank you so much for sharing it. I am going to be doing this tonight for FHE and wanted to let you know how much I appreciate this resource.